Not to be confused with the rock band Oasis, whose music I’ve never heard but I’m sure I’d hate, the Oasis Quartet is kind of like a barbershop quartet, except they play saxophones instead of sing. Straight out of the gate, their first album is self-titled, which is confusing, because if anyone ever asks me if I’ve heard Oasis Quartet, I won’t know if they meant the group (like, in a live setting) or the CD, causing the conversation to quickly descend into a quagmire of misunderstanding. Okay, now that my little hissy fit of negativity is over, let’s proceed into a more positive pasture. 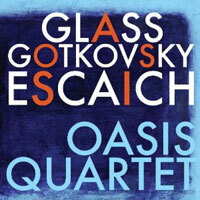 The album Oasis Quartet features the works of three 20th century composers. First up is Phillip Glass with his “String Quartet No. 3.” In this work, which was originally scored for violin but later adapted for sax, the soprano, alto, tenor and baritones float smooth, pleasant melodies throughout your apartment. Even if you don’t want to pay close attention, it will function perfectly as background music at your next dinner party–especially when the basil pasta is served up. Ironically, this smooth music was written for a film called Mishima, about a Japanese author and radical political activist who committed suicide after he arranged a coup attempt that failed! Thierry Escaich’s 11-and-a-half minute “La Bal” marries a little tango and waltz with a rock-like energy, occasionally employing outright dissonance and crazy Tetris shape-pounding runs. Ida Gotkovsky’s “Quatuor” is more somber for the first 23 minutes, only to get super urgent in the final section. Looking at this album as a whole, I’d say the Oasis Quartet–the group and the album–offers up a generous serving of sinuous saxophone for lovers of clean tones. You are currently browsing the archives for the Oasis Quartet category.